Figuring that there are a lot of older computers still around that could be made useable again by a gnu/linux operating system. Even more so by variants like Pulp which are specially built for older hardware. While the mainstream gnu/linux systems are incredibly easy to install and use, the speed of PULP comes at first glance at the cost of ease of use (not functionality though). This is due to the speedy, but older apps. Some of the apps used in PULP were developed when Pentium I computers where considered high- end or haven’t even existed yet. One of those apps is the default file manager: EMELFM. Emelfm is very powerful, and when you got used to it you will be faster than with ROX (the default filemanager of stock puppy linux). If you are familiar with ROX and desperately need it (e.g. to mount an isofile or a .sfs file) then you can start it by opening a terminal and typing ‚rox‘. OK, here’s a screenshot of a typical emelfm session. You see the so called two pane layout. For seasoned users who used Norton commander it should look familiar, also, If you know Norton commander this tutoral probably is a waste of time for you. Younger users probably see this the first time and If you don’t know what to do next, you are exactly in the same position I was a couple of weeks before. You see two folders side by side. One is independent from the other. To navigate around simply double click the folder (there are no symbols, but a folder is in blue text, while ordinary files are black, executables seem to be green) you want to have a look into and bingo there you are. To go up a directory double click on the ../ file in the current folder or the yellow folder button besides the adress bar. 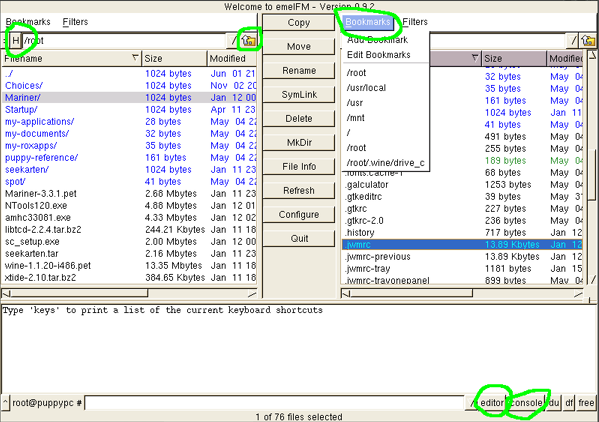 To copy stuff in emelfm from one folder to another you navigate to the original file in let’s say the left panel. Then you navigate to the target folder in the right panel. Highlight the file(s) you want to copy in the left folder and press the big Copy (or Move, or SymLink) button in the middle. That’s it, you are done. Of course you can copy from the right to the left panel too. I highlighted a few buttons in the screenshot above. We start in the upper left corner and go clockwise. H- Button: this toggles the ’show hidden files‘. T he same can be achieved by pressing ctrl+ h, press the button again and the ‚hidden‘ files are hidden again. yellow folder button: This button brings you to the directory above the current one. Bookmarks: Almost self explaining nowadays. Instead of clicking through the whole directory tree you can have a couple of paths in a bookmark menu- conveniently at your fingertips the whole time. The Add Bookmark button adds the current path to your bookarks, the Edit Bookmark button lets you edit, remove etc. your bookmarks. Of course you can always type in the desired path to your file in the addressbar. Edit button: In the lower left corner there is a button called Editor. If you click on it, it will open the currently highlighted file in an Editor. Console button. It opens a console in the currently active Directory. Right beside it are some other programs that might come in handy sometime. Play with it. You can easily add or remove custom commands. Just click on the configure button in the middle. The section of interest then is called ‚Toolbar buttons‘. for the advanced user it might be good to know that there is a built in commandline prompt. You don’t have to open a terminal in the current directory, just type whatever you want in the input field right beside the ‚root@puppypc‘. The output is just above of that. Of course most of this stuff can also be done by keypresses, for a list of the keybindings look under Configure- Key Bindings. Hope that helps with your first steps with PULP. Have fun, and if you need further Information or clarification – feel free to leave a comment.